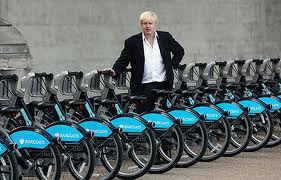 Boggins had his first go on a BorisBike today. It was just a short jaunt down Tower Bridge Road but it was a good feeling to be on 2 wheels again. The bike was quite heavy and even the highest gear was not very high, so there was no racing the couriers, but it was a very stable beast. Central London is fairly flat so no lung-bursters, but this out-of-practice former cyclist was giving off steam by the end.